Every time I put on leggings I think, "Why do people hate the legging trend?". And then I go out into the world and see people wearing nearly see through leggings. I can see all of their lumps, bumps (we all have them!) and their underwear! That's when I realized that not all leggings are created equal. If you want to jump on the legging bandwagon you should check that the leggings you purchase are made from thick material that is not see through once they are on your body. I also suggest sticking to neutral colours, unless you are normally crazy for patterns. It is easier to pass leggings off as regular pants if they are black, grey or dark brown. This outfit is super comfortable and warm! It consists of my black, long-sleeved breastfeeding top, black leggings, riding boots, plaid scarf and a black skinny belt. The belted scarf elevates these clothes into an "outfit" looks put together when you are running around grabbing groceries or the mail. The scarf adds a layer of coziness and it can be adjusted to add more warmth. Basically, it is the appropriate way to wear a blanket in public! I was out for lunch the other day and there was a nasty draft coming through the window. 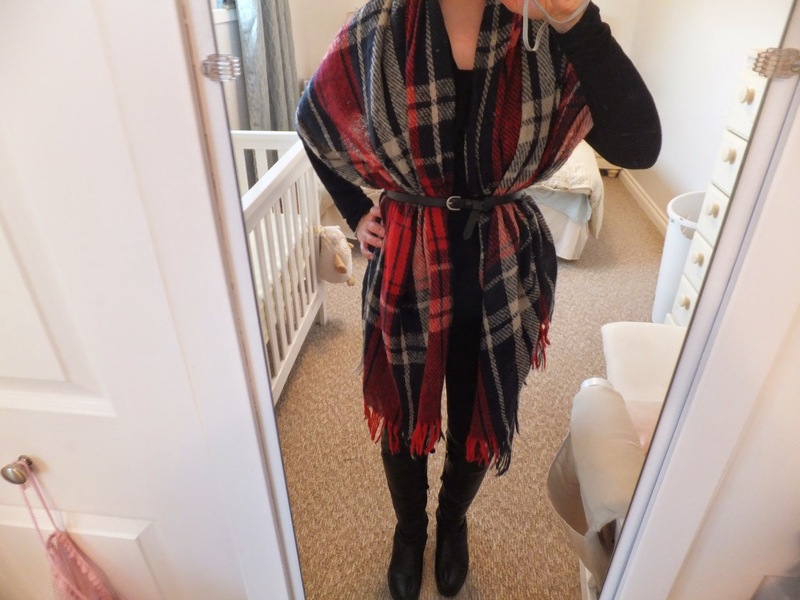 I was wearing this outfit so I just tugged the sides of the scarf down over my arms and I stayed warm! I apologize for the crappy picture. I plan to get Hubby to take the next one so that it is easier to see the outfit! I also went back to my "accessories" post and added in the belts that I wear with my outfits. i missed them, somehow! What is your favourite errand running outfit? Use #wardrobewednesdays and tweet me @peacefulsimple! I would love to see your outfits!